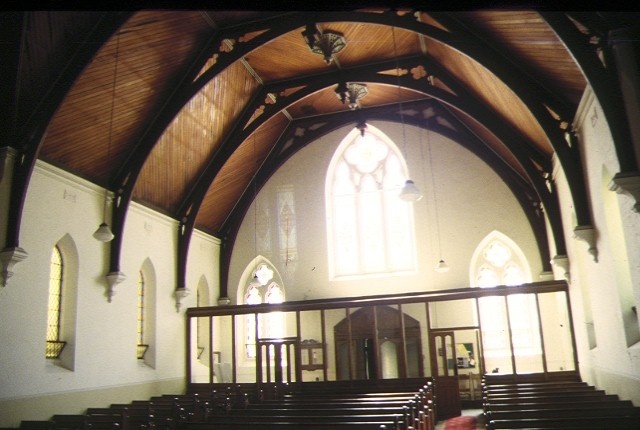 The College Church congregation initially worshipped in Ormond College in 1891. In 1895 they purchased the site of the present building. A committee set out certain specifications (including the crown tower), and a competition for the best design was won by architect RA Lawson. The building, constructed by Lang Brothers of Parkville at a cost of 2,170 pounds, was opened in 1898. College Church remained the only parish church in Parkville until 1934. The outstanding element is the crown tower, a choice of the first minister, the Reverend Alexander Yule. It is a copy, albeit on a reduced scale, of King's College Chapel, Aberdeen University, of which Reverend Yule was a former student. This crown tower is the only example in Victoria and is possibly unique in Australia. 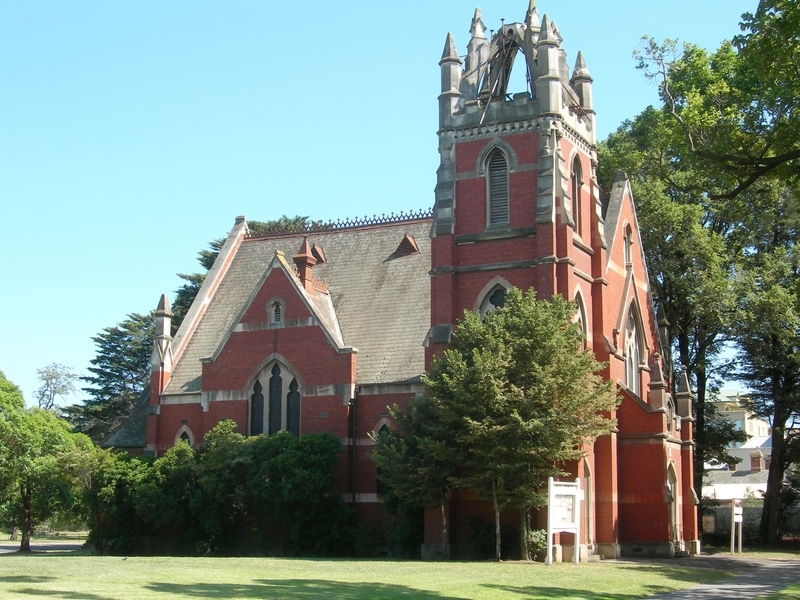 The church is constructed of red brick and Oamaru sandstone with a steeply pitched slate roof and parapeted gables. Windows are in the Gothic pointed arch style. The interior of the Church has a fine timber ceiling with arch braces. There are a number of quality stained glass windows, the two largest being dedicated to Mungo Scott and his wife, Scott having been a benefactor of the Church. The late nineteenth century pipe organ was built by George Fincham and Son (Richmond), with Professor Franklin Peterson as consultant, and was completed in November 1903. In the 1940s College Church was internally re-ordered and this work was designed by prominent church architect, Louis Williams. The church became part of the Uniting Church in Australia in 1977, and ownership subsequently passed to Mar Thoma Syrian Church in 2008. 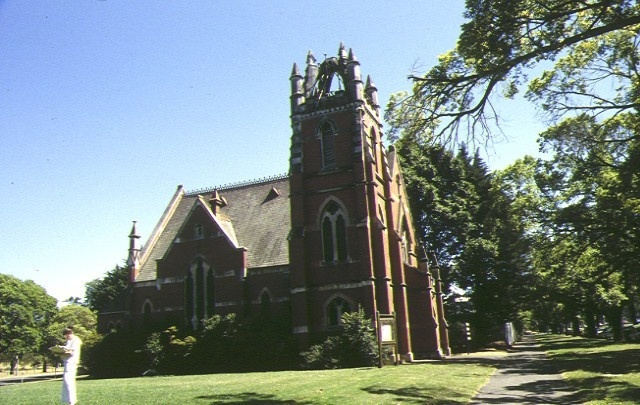 The former College Church is of architectural, social and historical significance to the State of Victoria. The former College Church is architecturally significant as an unusual example of a late Victorian, Gothic revival church. The church is particularly significant for its rare crown steeple surmounting the tower, the only known example in Australia and a rare example internationally. The building is important as an example of the work of the architect Robert A Lawson who designed a number of buildings in Victoria for the Presbyterian Church. The church is of architectural significance for its particularly fine ecclesiastical furniture and fittings such as the pulpit, lectern, communion table and fixed seating and panelling in the apse designed by Louis Williams in the 1940s. Additionally, the stained glass windows and the stone carving of a Burning Bush in the parapet of the porch are significant architectural elements to the composition. The former College Church is socially significant for the prominent part it continues to play in the life of the Parkville community and as a landmark building on one of Melbourne's premier boulevards, Royal Parade. 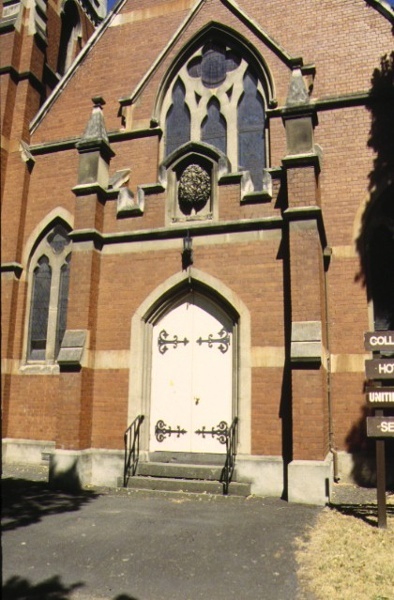 The building, which maintains strong associations with the nearby Theological Hall of Ormond College, is historically and socially important as a manifestation of the development of the Presbyterian faith in Victoria in the twentieth century. The former College Church is historically important as a rare example of a building constructed at the height of the 1890s depression when virtually all building operations ceased in Victoria. Parkville Uniting Church (formerly Presbyterian College Church), Royal Parade, Parkville, Melbourne City Council. 1. 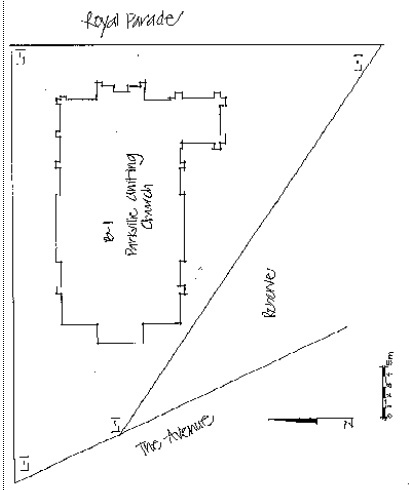 All of the building known as the Parkville Uniting Church and marked B-1 on Diagram 603663 held by the Executive Director. 2. All of the land marked L-l on Diagram 603663 held by the Executive Director being all of the land described in Certificate of Title Volume 2624, Folio 665. Crown towers are an unusual late Gothic idea representing in pre-Reformation days the papal tiara and in post-Reformation days the crown rights of Christ. The idea possibly arose in France, a source of influence to Scotland in the Middle Ages. St Giles Cathedral Edinburgh (tower 1485) is the best known example though that at Kings College Aberdeen (1506) is more remarkable. There is another church in Glasgow, a post Gothic church (Tolbooth Church) and there was one on the Great Church at Haddington, but that collaosed. The only other Scottish example was St Michaels Linlithgow but this too collapsed. The one remaining example in England is the Church (now Cathedral) of St Nicholas, Newcastle on Tyne, built in 1448. St Mary le Bow, London had a crown tower or something like it, but was destroyed in the Great Fire of 1666. But wait - there's more!!! Faverhsam Church, Kent had a new tower built between 1794 and 1797 to the design of London architect Charles Beazley (c1760-1829). The tower is built in brick with stome quoins and is topped by a crown tower. It was said to be inspired by St Dunstan's-in-the-East by Sir Chrisopher Wren. Beazley's design was known to have been copied twice: Waterloo Tower, Quex Park, Birchington, completed in 1819. The other copy is at St John's, New Town, Tasmania. John Lee Archer was a pupil of Beazley in London. He was made Civil Engineer and Colonial Architect for Van Dieman's Land in 1827. On 24 October 1833 he wrote to the Colonial Secretary requesting approval for a design of a tower at St John's "of a similar description to one ordered at Faversham in Kent some years ago which was admired". H A James, Faversham Parish Church, A History and Guide, Faversham [Kent], 1990, pp 26-7. "An excellent example of a picturesque neo Gothic church by the celebrated Colonial architect John Lee Archer. Built in 1834-5, the church is the focal element for the St Johns precinct being linked visually to the watchouses by the axial St Johns Avenue with its fine planting, and joined to the orphan's school by colonnades. Fine stone neo Gothic church, originally designed with a spire, the central element of the St John's precinct. Picturesque three level Gothic tower with corner turrets through levels two and three, and central spirelets to castellated parapet. Lancet openings - tracery to level two, louvres to level three. Octagonal turrets at each corner of main body of church. Colonnades to each side linking to orphan's school." There is no crown tower - was the design not executed? Did the Colonial Secretary think the crown tower was an unnecessary expense? College Church has a crown tower, believed unique in Victoria, is a landmark on Royal Parade and is a significant church design from the later 1890's, anticipating church design of the 1900's. The crown tower gives this church particular distinction, and its landmark role, though the top part of the crown was demolished in recent years due to decay of the stonework. Evidently required in the design of the church by the first minister Rev Alexander Yule (1891-1907), this feature emphasises his influence on the early years of this parish, while a memorial within the building ( and another in the Sunday School building in gatehouse street ) testify to the regard in which he was held. Otherwise the building is a well detailed, fairly typical church for the time of construction, the side recesses forming token transepts being an unusual and probably unique feature. The windows in these side recesses and that over the main entrance are fine examples of stained glass. The interior is largely intact, the altar furnishings and glazed windlock being later changes. The ceiling and trusses are of note internally. Externally the ridge cresting, roof vents and the burning bush over the main door are features. Very few churches were built during the 1890's following the great economic crash of the early 1890's; this rarity of comparable examples gives this well detailed church added distinction.